CodeMeter Cloud Lite offers a simple, but powerful means for licensing via a cloud server. It was designed with SaaS, server, and mobile applications in mind. CodeMeter Cloud Lite is fully compatible with CodeMeter License Central and includes a dedicated set of the established CodeMeter capabilities. 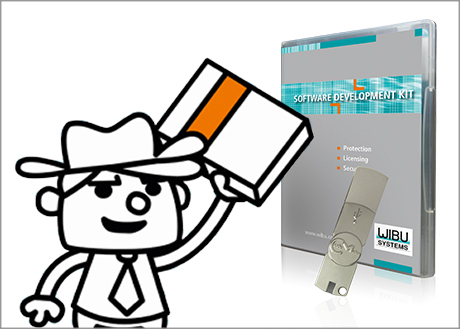 CodeMeter Cloud Lite is a separate server in the cloud, which can be operated either by yourself or by Wibu-Systems. CodeMeter Cloud Lite has the necessary interfaces (including OAuth2, SAML) to work seamlessly with existing SSO (Single Sign On) solutions in your established IT landscape. This guarantees that existing user accounts can be used with CodeMeter Cloud Lite. As is the case with all types of CodeMeter licenses, the licenses are created and delivered through CodeMeter License Central. Any integration with existing CRM, ERP, or e-commerce solutions can remain in place. Instead of activating or transferring the license in a local CmContainer, it is assigned a User ID, with a CmCloudLiteContainer created automatically on the server. The user can then use the license directly from CodeMeter Cloud Lite. No local runtime needs to be installed. CodeMeter Cloud Lite works with SaaS applications, apps on mobile devices, or standard desktop software. CodeMeter Cloud Lite uses the standard processes of CodeMeter License Central. It gives you a new choice of container, CmCloudLiteContainer, letting you determine whether the license can only be used with CodeMeter Cloud Lite or also transferred to a local CmDongle or CmActLicense. In that latter case, the user has the freedom to choose where to move the license. The license can be retrieved for a new activation by deactivating the offline license or removing the license from the account in CmCloudLite. CodeMeter Cloud Lite truly comes into its own with server and SaaS applications. Users can log in to a SaaS application, which would check with CodeMeter Cloud Lite which licenses are available and unlocks the licensed features. Mobile applications for tablet computers or smartphones can also be used with CodeMeter Cloud Lite licenses, either by direct integration in the app or by relying on the server. Local applications can be additionally protected against tampering and reverse engineering by using CodeMeter Protection Suite and a Protection Only License. The great advantage of CodeMeter Cloud Lite is that it aligns the processes on both the cloud and the on-premise side. CodeMeter License Central can be integrated with SAP, Salesforce, or other ERP, CRM, and e-commerce solutions, making the process for creating licenses automatically available for CodeMeter Cloud Lite. Traditional solutions need users to actively return a license. With CodeMeter Cloud Lite, the user can use the license again without any specific action on his or her part, even on a new device. You determine a timeframe for the license’ period of allocation; a keep-alive option extends that period automatically from within the active application. When that time has expired or the license has explicitly been cleared by the application, it is available again for your user. Multiple licenses make it possible for users to use their applications simultaneously on several devices.